We are happy to stock the famous GROOM PROFESSIONAL Original Cologne. With so many available recently, it is wise to have a make you can trust. The GROOM PROFESSIONAL Original Cologne is certainly that and will be a perfect acquisition. For this reduced price, the GROOM PROFESSIONAL Original Cologne comes widely recommended and is a regular choice for many people. Groom Professional have added some nice touches and this equals good value. 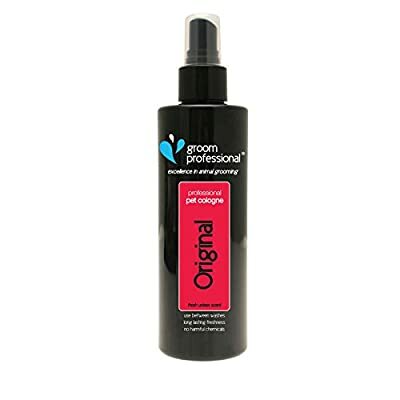 Groom Professional Original Cologne This was Groom Professionals first ever pet cologne and is still in the range after all these years. Suitable for both male and female dogs to freshen them between and after washes, masking any nasty smells while the camomile helps to sooth their skin. This Fragrance is a very fresh clean, slightly sweet smell, making it a great unisex cologne. Still a favourite over all this time Very rich, recognizable scent that lasts for days Contains camomile to sooth the skin Available in 200ml, 500ml and 4 Litre To Use: Simply spray once or twice on to the coat (not near the face) or alternatively spray on to a brush and glide this through the coat to apply and leave the dog smelling lovely for days. Helpful Tip: This spray can also be kept in the house, salon or car to freshen up rooms and add a pleasant smell that lasts.